This article is about the section of Interstate 94 in Wisconsin. For the entire route, see Interstate 94. Interstate 94 (I-94) runs east–west through the western, central and southeastern portions of the U.S. state of Wisconsin. A total of 348.23 miles (560.42 km) of I-94 lie in the state. The route, cosigned with US 12, enters from Minnesota just east of the Twin Cities. The route passes north of Menomonie and south of Eau Claire before turning southeast and heading towards Tomah where it joins I-90. The two Interstates run concurrently for the next 91.76 miles (147.67 km) to Madison. I-94 enters the state as a six-lane facility which reduces to four-lane at exit 4 (US 12). I-94 passes by the popular tourist destination of Wisconsin Dells. The route converges with Interstate 39 63 miles (101 km) southeast of Tomah (near Portage). This concurrency (30 miles) is the longest three-route concurrency of the Interstate Highway system and only one of two in existence. The interchanges mark a return to a six-lane configuration. I-94 turns eastward toward Milwaukee at what is commonly known as the "Badger Interchange" where the three interstates meet with WIS 30. The route returns to four lanes after the interchange traffic merges, then returns to six lanes just west of Waukesha. The highway remains a six-lane facility (with various auxiliary and collector–distributor lanes in Milwaukee at interchanges) east and south of this point, and through the area is officially designated the East–West Freeway, though very few organizations, including the Wisconsin Department of Transportation's traffic control center in the area actually use that name. I-94 passes through downtown Milwaukee, turning southbound and joining I-43 for six miles (9.7 km), into a road designated from Ozaukee County to the Illinois state line as the North–South Freeway. I-94 leaves Milwaukee to the south, joining with I-41 at the Mitchell Interchange. These two Interstates run concurrently to the border, passing west of Racine and Kenosha on their way into Illinois toward Chicago. Traffic is heavy along this stretch. The speed limit on I-94 from the Minnesota border to the Waukesha/Milwaukee county border is 70 mph. Entering Milwaukee County, the limit decreases to 55 mph. The limit is 55 mph until just west of Marquette Interchange, where it decreases to 50 mph. This 50 mph limit continues to the Airport Interchange, where it increases to 55 mph. Between Rawson and Drexel Avenues, the limit increases to 70 mph and maintains this limit to the Illinois border. I-94 was the first section of the Interstate Highway System completed within the state of Wisconsin. This seven-mile (11 km) section, between the unincorporated town of Goerkes Corners (currently at the intersection of US 18 and Barker Road) and Waukesha was built in 1956. The route was added segment-by-segment over the years and was completed to its current alignment in 1968. From 2004 until 2008, a portion of I-94 in Milwaukee was reconstructed as a part of the Marquette Interchange project. Beginning in 2009 and continuing until 2021, the 35 miles (56 km) of I-94 between the Mitchell Interchange and the Illinois state line will be widened from six to eight lanes. This includes a complete rebuild of the roadway, modern frontage roads, and interchange improvements including a new design of the Mitchell Interchange in Milwaukee County. Additional plans are underway to accommodate the extra traffic and needs of the Mount Pleasant Foxconn plant currently in the design and development stages. 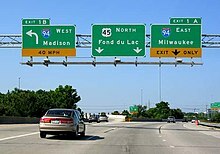 Two spur routes of I-94 exist in Wisconsin, both are in the Milwaukee metropolitan area. I-794: a spur in downtown that accesses the southeast suburbs and the Port of Milwaukee. I-894: a southwest bypass of the city. Northwest Region Staff (May 14, 2009). State Trunk Highway Log for Region 5. Eau Claire, WI: Wisconsin Department of Transportation. pp. 547–570. Southwest Region Staff (December 31, 2008). State Trunk Highway Log for Southwest Region (XLS). Madison, WI: Wisconsin Department of Transportation. 094E. Southeast Region Staff (December 31, 2008). State Trunk Highway Log for Southeast Region (XLS). Waukesha, WI: Wisconsin Department of Transportation. 094E. This page was last edited on 16 February 2019, at 18:18 (UTC).